Tobacco smoking is a major public health issue worldwide. It is responsible for many preventable diseases, contributes to a large number of premature deaths and accounts for enormous economic costs. The chapters in this book review a variety of topics related to the sociodemographic characteristics of tobacco consumers, promotion and merchandising of tobacco products and health consequences of smoking. 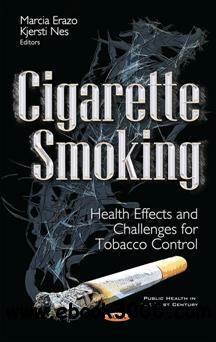 It also reviews the mechanisms by which tobacco produce damage, and discuss different interventions for tobacco control. The mechanisms by which cigarette smoke affects health are diverse. Thousands of chemical components, mainly toxins and carcinogens are part of tobacco smoke. These components promote the development of cancer, cardiovascular and respiratory disease through specific or nonspecific mechanisms. Common pathways include DNA damage, mutations of critic genes, vasomotor dysfunction and oxidative stress, among others. The effects on health of first-hand and second-hand smoke exposure have been widely studied, and there is growing evidence regarding consequences of third-hand smoke exposure. The constituents, dynamic transformation and distribution of third hand smoke are a fruitful area of study, as much as the quantification of its exposure. In this book, many useful indicators of exposure to environmental tobacco smoke are analyzed, ranging from surrogate indicators to direct measurements of the components that reflect dose-response. Advances in this field can provide useful information on the extent and effects of smoking, implementing and assessing tobacco control policies.